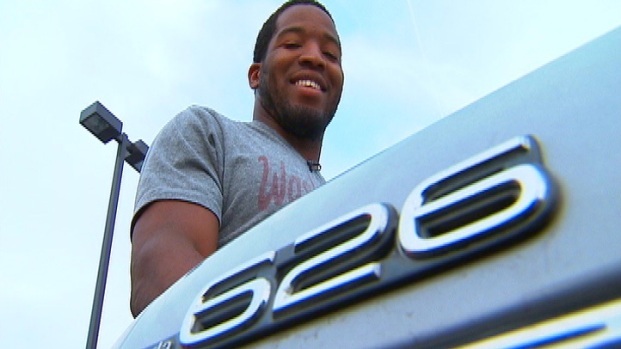 Mazda Refurbishing Alfred Morris' 22-Year-Old "Bentley"
You may remember that even after signing a four-year contract worth over $2.2 million last year, Redskins running back Alfred Morris elected to keep his 1991 Mazda 626, affectionately known as "Bentley." It served as a symbol of Morris' career path from humble beginnings at Florida Atlantic to finishing second in the NFL with 1,613 rushing yards in his rookie season. Kelley Blue Book estimated the value of a 1992 Mazda 626 in perfect condition was worth about $1,160, so you can only imagine how much -- or little -- Morris' car is worth. "It's not 'Pimp My Ride' or anything," Morris said. "No big rims or fish tanks in the back." Take a Ride in Alfred Morris's "Bentley"
Morris said the folks at Mazda would fix his "cracked dashboard," fine tune the engine and work on the transmission to make sure he doesn't find himself on the side of the road. There's a chance they could throw a few perks in there as well, but nothing extravagant. "Like a navigation system or something maybe," Morris said. While you're at it, Mazda, I have a Mazda 3 that could use some work. Get at me. I'm sure Mo would be cool with it.